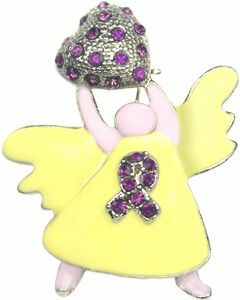 This Epilepsy Rhinestone Angel Pin is a lovely way to commemorate or recognize persons who are active in Epilepsy awareness. Each Brooch is well made and features a beautiful angel wearing a purple rhinestone pin and holding a purple heart. Measures 1.75 by 1.25 inches. Make sure to check out our Epilepsy Awareness Products.